Everybody in the audio and music industry knows Electro-Voice for creating top-notch products that range from studio recording, to live sound and well beyond. Over the years, they have built up their reputation as a company to become one of the leading manufacturers in music. Well after their acquisition by Bosch Security Systems in 2006, the company has continued to deliver time and time again. 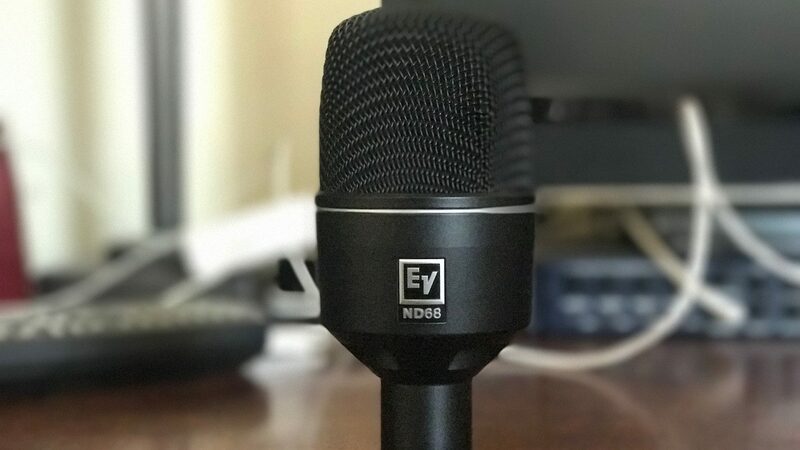 We recently had the pleasure of reviewing the Electro-Voice ND68 dynamic kick-drum microphone, one of 6 new microphones announced by the company last year, as a part of their latest ND series. The Electro-Voice ND68 microphone, (like the Electro-Voice ND66 we recently reviewed), is packaged in a shrink-wrapped box. Inside, you will find a custom mic clip for the ND68, as well as a nylon carrying pouch. The microphone itself definitely has some bulk and weight to it which is pretty typical to kick drum microphones. It has a shiny matte black color and finish which gives the microphone a unique appeal. The Electro-Voice ND68 microphone sounded great when used on a drum kit. Nothing stood out to us necessarily as sounding tonally unique or different from other popular kick drum microphones, but it absolutely fits into that standard level. Depending on placement, you can use your ND68 to dial in any desired tones from your kick, or other percussive instruments. Close placement emphasized the sharp attack of the beater, and as we moved further back to place it in a typical “kick-out” position, no significant loss of tone was noticed other than what was expected from the placement change. Before we put the ND68 to the test, we had expectations of it’s low-end sounding similar to the likes of the Electro-Voice RE20. The resulting sound was similar, but there were some distinct improvements to the low end response of the ND68 that we loved. Overall, the Electro-Voice ND68 dynamic kick drum microphone left us pleasantly surprised. Despite it’s sound and tones being comparable to other kick drum microphones available on the market, it’s clear that Electro-Voice has done some great work on expanding the variety of equipment they offer. If you’re in the market for a solid kick drum microphone, for around $200, you can find an ND68 to try for yourself and stow in your mic locker. You certainly won’t be disappointed.